New Braunfels is a historical city near San Antonio, Texas, which has German roots dating back to the 1800s. It is a smaller city nestled in Texas Hill Country with a population of just over 70,000. There are many things to do and see in New Braunfels and it is a sure bet that you will find something for everyone in the family to enjoy. Camping resorts are plentiful and many are close by. Check out one you would like to try and head to the Lone Star State. While you are visiting this historic city there are many fun and educational places to visit. Here are a few you can check out while you are camping in New Braunfels, Texas. So, pack up the RV and head to Texas Hill Country. You won’t be sorry you did! Travel over Christmas break isn’t something new—but it doesn’t have to mean a crowded ski lodge or peak-season-priced hotel rooms. If your family’s ready to try something new, why not pack the RV and find the magic of Christmas on the road? For regions where weather conditions don’t favor RV travel, consider flying to a warmer spot and picking up a rental RV for your adventure. We’ve collected some tips for keeping Christmas merry and bright while traveling by RV with the family. Pick one or try them all—these ideas are handpicked to bring holiday cheer to RV camping families. We’ve even got a Holiday Special to help with your RV rental! What RV camping destinations are popular at Christmas? Let’s narrow that answer down a bit. What does your family enjoy doing together? Where have you dreamed of going to get away for the holidays? Combining the winter holidays with activities everyone will enjoy is the key to an unforgettable holiday RV road trip. 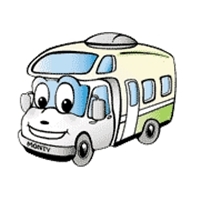 Here are just a few suggestions for holiday RV travel destinations. Ski Resorts with RV Parks combine winter sports, beautiful mountain settings and affordable accommodations. An excellent example of a year-round campground is the Fireside Resort near the ski slopes in Jackson Hole, Wyoming. Many ski resorts allow boondocking, or dry camping, in self-contained motorhomes in their parking lots, so be sure to ask what’s available. Theme Park Christmas Getaways are perfect for RV camping families who want to keep the fun going over the holidays. A big plus—theme parks dress up in their holiday best and host special events to add excitement to your family’s winter break. Many RVers are familiar with Fort Wilderness Camping Resort at Disney World in Orlando, Florida, but did you know there are plenty of other options for holiday camping near theme parks? Check out Paradise by the Sea Resort in San Diego. You’ll be within easy driving distance of Legoland and San Diego Sea World. Arlington KOA is minutes away from Six Flags Over Texas. When you’ve chosen your theme park destination, look for on-site campgrounds or campgrounds within an easy drive. Discovering natural wonders is one more way families who camp together get the most from their winter breaks. Think of the memories you’ll make sharing Yuletide delights surrounded by desert vistas (Mojave National Preserve in Southern California), discovering trails along a rocky riverbank (Colorado Bend State Park north of Austin, TX) or exploring Jekyll Island off the coast of Georgia. Twelve Days of RV Christmas: Pick a theme and plan small gifts for everyone to enjoy each day as the holiday approaches. Time together as a family is the goal as each person unwraps the day’s gift. You could also draw names for ‘Secret Santa’ gifts to be purchased along the way or before you begin your trip. Take Holiday Traditions on the Road: Bring along the holiday traditions that mean the most to your family. Pack the holiday books or movies you always share as a family. Sing along with Christmas music on the radio. Make each youngster a travel bag with holiday-themed coloring or puzzle books. Let older kids choose an audiobook of a Christmas classic to share. Bring the ingredients for favorite cookies and candies, and spend the day baking together at the campground. Stock your RV kitchen with cocoa mix, marshmallows and candy canes for a shared treat while watching for Santa. Buy Command™ hooks to hang stockings without damaging the walls of your motorhome. Do you always have chili for Christmas Eve dinner? Is there a special cookie plate to set out with Santa’s goodies? All it takes is a little planning to transform your winter RV trip into a holiday to remember. Holiday travel by RV can be whatever your family wants it to be. Carry on treasured traditions while traveling to a special destination, or explore the holiday traditions of other regions and cultures. Camp in extraordinary natural settings and spend the time bonding with your family. Traveling by motorhome gives you the freedom to shape your winter holiday celebrations into something remarkable. RV travelers who enjoy good wines simply must make the trip to Texas Hill Country. That’s where you’ll discover more than two dozen wineries that call this scenic region home. You’ll also find warm Texas hospitality waiting at RV resorts and campgrounds near towns like Fredericksburg, Kerrville and Boerne. Grab your corkscrew and travel along as we journey the Texas Hill Country Wine Trail by RV. Picture a circle that begins west of Temple, TX at San Saba and then swings south and east to encompass Austin and New Braunfels, west to pick up Kerrville and Fredericksburg and then back north to its starting point. That’s a rough approximation of the Texas Hill Country Wine Trail. It leads to vineyards and tasting rooms in the towns we just mentioned, plus those in Hill Country burgs like Stonewall, Tow and Dripping Springs. The vineyards stretch out for miles, offering spectacular views that invite Texas RV travelers to stop and drink in the beauty unfolding through their windshields. The vineyards that dot the countryside offer award-winning vintages for visitors to sample in their tasting rooms. Surrounded by historic buildings, state-of-the-art winemaking technology and beautifully groomed grounds, Hill Country wineries invite you to stay and sip awhile before choosing which wines to take home with you. Here’s a small sampling of the amazing establishments RV travelers to Texas will enjoy while visiting Hill Country. Be sure to use the link above to learn more about what’s waiting for you there. Dry Comal Creek Vineyards, a small boutique winemaker near New Braunfels, pioneered the ‘Black Spanish’ wine explosion in Texas. Beautiful grounds and one heck of a survival story make them a favorite with Wine Country visitors. Chisholm Trail Winery just west of Fredericksburg is famous for its free-roaming livestock as well as its wide selection of award-winning wines. Perissos Vineyard & Winery near Burnet, TX is not only scenic, it’s a friendly, family-run place that’s been built on a tradition of excellence. Fredericksburg Wine Road 290 is a collection of fifteen wineries along US Hwy 290 east of Fredericksburg. If you’re limited on time and would like to visit as many Hill Country wineries as possible on your RV camping trip, this is the place to be. From Grape Creek Vineyards to Lost Draw Cellars, the tasting rooms along US Hwy 290 are sure to offer a new favorite. Once you’ve settled on the wineries you’d like to tour, it’s time to book the campsites that suit your style and budget. Texas Hill Country campgrounds run the gamut from a small but scenic golf and RV resort on the Llano River to an urban RV campground just south of Austin. You’ll also find numerous Corps of Engineers campgrounds at area lakes and an impressive number of affordable, well-maintained campgrounds in towns like Kerrville, Bandera and Spicewood. Whether you’re planning to meander your way through Hill Country, visiting one winery at a time, or to book a chauffeured Wine Country tour, complete with guide, your RV trip to visit Texas Hill Country vineyards will be remarkable. Be sure to check the websites of the ones you’d like to visit, as many of them host special events that will add even more enjoyment to your trip. And don’t forget, El Monte RV Rentals in Dallas is just three hours north of Hill Country wineries and always happy to help with your travel needs. Bring your kayaks and canoes to Bastrop, Texas, RV travelers, for some stellar paddling action on the Colorado River. This beautiful waterway provides year-round recreation in the Austin area, whether you like to fly fish, paddle, hike a trail or simply set up camp nearby and watch the sun rise over the river. If you’ve never traveled to this stretch of Texas, your best route from the north is I-35 from Dallas to Austin, then thirty miles southeast to Bastrop via TX-71. Once in Bastrop, you’ll find the perfect launch spot for the six-mile El Camino Real Paddling Trail at the city’s Fisherman’s Park. Take a few minutes before you launch to enjoy Bastrop’s Riverwalk that links this park to Ferry Park just down the river. When you’re done admiring the view, head back to the boat launch and paddle downstream toward Lost Pines Recreational Trails. The Colorado makes a big loop around the city of Bastrop, but you won’t know you’re close to town once you get out on the water. The unspoiled, backwoods beauty of this paddling trail makes it popular for kayakers, fly fishermen and the well-run paddling tours led by local outfitters. If you don’t have your own watercraft, be sure to book a tour as you plan your RV camping trip to Bastrop. For paddlers who want to drop a line while on the water for Guadalupe bass, smallmouth bass or channel cats, the El Camino Paddling Trail offers excellent prospects. When you decide to take a break from the water, head over to Bastrop State Park to enjoy the beauty of the ‘Lost Pines’, a remnant of loblolly pines found only in this section of Central Texas. You’ll also find RV campsites there, so if you like the idea of camping in a deep, green forest, by all means set up camp there for the night. Another popular way to get out on the Colorado River while camping near Bastrop, Texas involves a visit to the Colorado River Refuge. Accessible right in town in the Tahitian Village Subdivision, the Refuge offers not only hiking trails and nature talks led by local volunteers, but also a launch point to yet another scenic stretch of the Colorado. If you’d like to paddle a little longer on the Colorado near Bastrop, why not take the Wilbarger Paddling Trail? Put in at the bridge north of Bastrop on Farm-to-Market Road 969 and float fourteen miles past sandstone cliffs, hardwood forests and plenty of birds and wildlife, all the way down to Fisherman’s Park. Bonus Bastrop Travel Tip: Don’t leave this Texas small-town gem without experiencing the charm of Bastrop’s Main Street. Maxine’s on Main is known throughout Texas for rib-sticking eats and the homes and shops around town represent with flair one of the Lone Star State’s earliest settlements. With several campgrounds located along the river in the Bastrop area, including the Colorado River KOA, there’s no obstacle to an extended RV camping and paddling expedition to Central Texas. Get in touch with us for a Texas RV rental and plan to spend time on the Colorado River soon.